Zion's path to the Final Four goes through the nation's capital. Zion Williamson and Duke are the overall No. 1 seed in the NCAA Tournament. 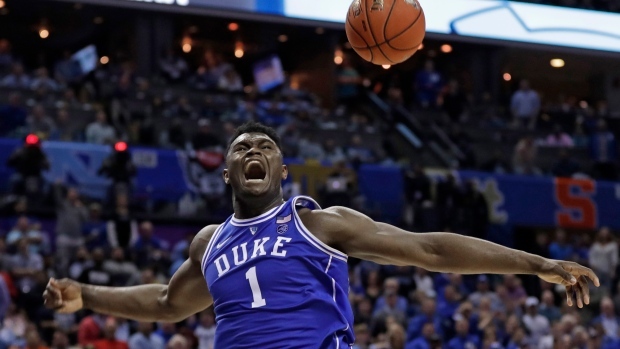 The Blue Devils sit atop the East Region, and their road to Minneapolis could include matchups with ACC rival Virginia Tech -- which beat Duke without Zion -- and Big Ten champion Michigan State. "It's tough to determine what our potential is," coach Mike Krzyzewski said Saturday. "I just want to have us play as good as we possibly can play right now. ... I hope we're in this tournament for a long time -- that will make us even better." Fifth-ranked Duke's top competition in the East comes from second-seeded Michigan State -- which lost forward Kyle Ahrens to a left leg injury in the Big Ten title game Sunday -- third-seeded LSU and fourth-seeded Virginia Tech. The Hokies beat Duke 77-72 on Feb. 26 after Williamson's foot injury against North Carolina. Krzyzewski hopes centre Marques Bolden returns at some point in the tournament, which would give his team even more post depth to handle the likes of Michigan State if it came to that in the Elite Eight. The Cavaliers are the second overall No. 1 seed and back in the South Region bracket after losing to the University of Maryland-Baltimore County -- better known as UMBC -- a year ago. This is the seventh time Virginia has been a No. 1 seed and the fourth time in six seasons, though the Cavaliers still are looking to reach their first Final Four with coach Tony Bennett. The Cavaliers (29-3) will play an NCAA Tournament newcomer in Gardner-Webb (23-11) of the Big South Conference on Friday in Columbia, South Carolina. Virginia had been in the running to be the top overall seed until losing 69-59 to Florida State in the ACC Tournament semifinals. The Cavaliers find themselves in a bracket with Tennessee, which had been hoping for a No. 1 seed, Wisconsin, Purdue and Cincinnati. Gonzaga is the No. 1 seed in the NCAA Tournament West Region despite losing in the West Coast Conference tournament title game. Big 12 regular-season champion Texas Tech was the No. 3 seed and Florida State earned a No. 4 in one of the bracket's toughest regions. Marquette will have one of the most intriguing first-round games with high-scoring Golden Eagles guard Markus Howard facing Murray State's dynamic guard Ja Morant in Hartford, Connecticut. North Carolina was rewarded for navigating a brutal schedule, earning the No. 1 seed in the Midwest Region after it tied Virginia for the regular-season ACC title and took Duke down to the wire in its conference tournament. That's just about its only reward. The Blue Devils earned the overall No. 1 seed and were given the more preferable East Region, and that means the Tar Heels will be travelling all over the country in the NCAA Tournament. They'll open against MAAC tournament champion Iona on Friday in Columbus, Ohio, and could face eighth-seeded Utah State or ninth-seeded Washington for a spot in the Sweet 16. Which happens to be in Kansas City, Missouri, just down the road from where Roy Williams once coached Kansas. And who should be the No. 4 seed but the Jayhawks, who could earn another trip to the Sprint Center -- where they just lost the Big 12 Tournament final -- with a pair of wins. If they advance, they would have to face seventh-seeded Wofford -- the Southern Conference champ and mid-major darling, currently on a 20-game win streak -- or Seton Hall, a team that already topped Kentucky once this season and knocked off Marquette twice and Villanova once. Iowa State packed the Sprint Center during the Big 12 Tournament, and it was that support -- even in the finals against nearby Kansas -- that helped propel the Cyclones to the championship. They figure to have even more support if they get past Ohio State in the first round and the Houston-Georgia State winner to reach the Sweet 16 for the first time in three years.